Rachel Rose, Open Egg, 2018. Rock and blown glass, 4 3/8 x 10 1/4 x 5 1/2 inches. Courtesy of the artist; Pilar Corrias, London; and Metro Pictures, New York. The lights are off. No overhead lighting, no spotlights. Nothing other than a sanguine glow emanating from the emergency exit signs and the sporadic flash of nearby smartphone cameras. Cloaked by darkness, objects installed in the gallery are barely discernible, their details obscured. The usual markers for a gallery are absent—there are no press releases, checklists, or wall placards. Unmoored, I must recalibrate my expectations. There’s also a simultaneous sensorial recalibration. Unable to depend on my sight, I rely on my senses of hearing and smell. There’s sound: chanting from a woven structure in the center of the front room. There’s scent: a citrus fragrance wafts through the air as I make my way through the back of the gallery. As my eyes slowly adjust to the dimness, the art comes into focus. I find that the more time I spend with the works on display, the more visible they become. Life to come. 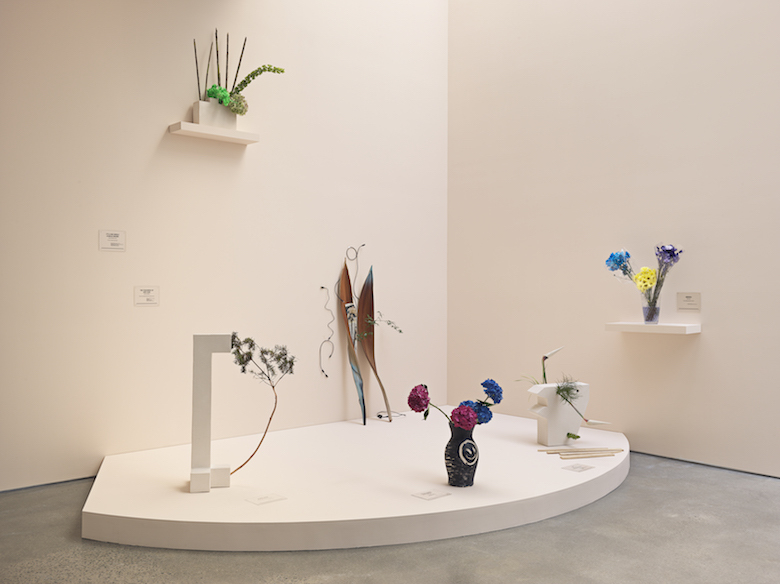 Installation view, 2019. Metro Pictures, New York. Courtesy of the artists and Metro Pictures, New York. The curatorial vision of artist Asad Raza who organized “Life to come,” currently on view at Metro Pictures, is that the show “brings together works that meditate on the creation of new worlds and new models for living” which is stated in the press release on the gallery’s website. The works on view, by fourteen artists, include sculpture, sound, film, and installation. Raza is adept at “crafting experience,” much like the artists whose work he has assembled here. Several of them—Camille Henrot, Tino Segal, Philippe Parreno, and Dan Graham—also participated in Raza’s previous collective endeavor, “The Home Show,” in 2015. There, Raza staged a group show in his own apartment that presented “the portrait of his life,” as he has referred to it. “Life to come” communicates Raza’s continued fascination with the concept of placemaking: design of spaces that reflect a communal well-being. “The Home Show” took on intimate domestic spheres; now Reza has applied his practice to a public area, the gallery. “Life to come” translates individual ideas about the genesis of place primarily through sculpture, sound, and scent into a collective reimagining. New beginnings need not be dramatic. In the absence of bold pronouncements, this show hinges on nuance, as in Alia Raza’s Amniotic Conversation (2019), an olfactory installation that releases a different aroma into the space daily, a subtle change from the scent the day before until the gallery on the last day of the exhibition smells different from the first. A transition meant to be soft and almost undetectable. Quotidian even, allowing for the promise of a new world to begin wherever you are. Intimacy is introduced into “Life to come” through the attendants (or “hosts,” as they are referred to by the gallery) who are available to guide audiences through the show. In lieu of typical exhibition literature, the hosts travel through the gallery, acquainting visitors with the works on view and attempt to engage them in conversation. They explain, for example, Rirkrit Tiravanija’s untitled 2019 (more is not there) (2019), an unsettling intervention to their eyes (each attendant has had her eye color temporarily changed via contact lenses for this exhibition). The hues are just unnatural enough to signal one’s awareness to Tiravanija’s understated piece. Through this slight modification of the body, the artist demonstrates how small adjustments to appearance may also serve as sites of invention: the hosts’ performances –enhanced by an external cosmetic adjustment– signal a willingness to exist in a modified form. Even if the changes are not permanent, the practice of enacting these adaptations is germane to exhibition’s concept. An attendant approaches me as I examine a sculpture of an egg resting sideways on a wooden pedestal in the front room. The egg is made from an oversized rock cracked in half, the craggy opening exposing short crystals within. A trail of opaque white glass oozes from the fissure like a runaway yolk. The amicable attendant informs me that the artist, Rachel Rose, was drawn to the concept of luteinizing hormone (LH) as she conceived of this work, Open Egg (2018). Produced in both males and females, LH unites sperm and egg in the human body. She asks me whether I think this is what the sculpture conveys and I answer no. The sculpture shows the opposite in my opinion—a movement out, instead of in. The yolk appears to escape the shell, not flow toward it. Our short dialogue ends. I stay with the sculpture after she leaves to chat with another visitor, searching for unity. I’m not sure that I found it. A small group of patrons gather inside one of Hana Miletić’s woven Jacquard textile pavilions, Softwares (white polyester and grey cotton) (2018) and the hosts ask for our participation. We are about to mimic their movements and chant, enacting a short exchange based on Shaker rituals. Hands wave, heads shake, and feet stomp collectively. The Shakers–also known as the United Society of Believers in Christ’s Second Appearance–are “the longest-lived American utopian experiment,” and were dubbed as such for their ecstatic movements during worship. Established in England in the 18th century by religious radical Ann Lee, the community practiced “social, sexual, economic, and spiritual equality” well before it was customary. Adhering strictly to four precepts: community, celibacy, confession, and detachment from society, Shakers crafted ways of living that promoted inclusivity if individuals were willing to abide by their doctrine. 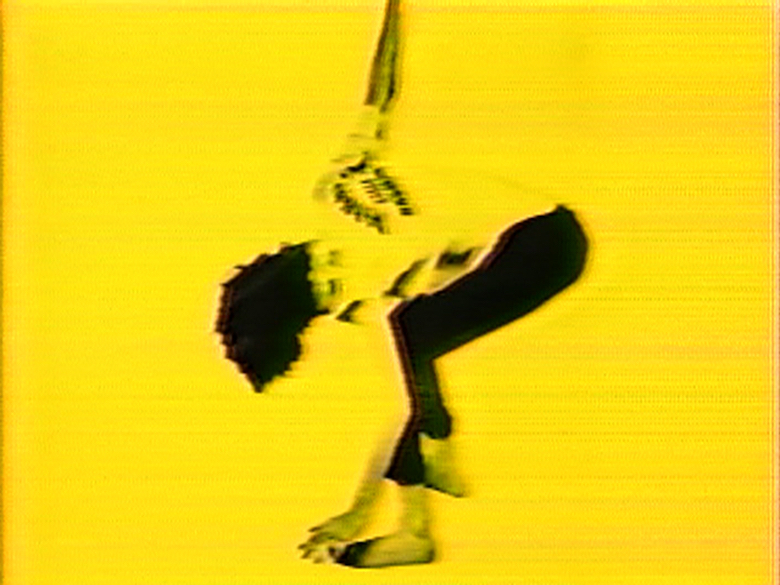 Dan Graham’s video on the second floor of the gallery, Rock My Religion (1983-84), is a compilation of footage from the latter part of the 20th century, tracing the counterculture that sprung up around rock and roll in the 1960s: dancing, hippies, psychedelic drugs. It motions toward Shakers as precursors to the popular musical movement. Both Miletić’s and Graham’s work reference the possibility of profound change being possible outside of the mainstream, where normative customs can constrict alternative ways of living from flourishing. These works demonstrate that the act of coming together­ to worship, to sing, or to get high are instances of placemaking, where the group attempts to prosper under communal actions. Dan Graham, Rock My Religion (video still), 1983-84. Black and white and color video, sound, 55 minutes 27 seconds. Courtesy of the artist; Electronic Arts Intermix (EAI), New York; and Metro Pictures, New York. “Form inside form inside form,” the rock drones. A soothing woman’s voice, spoken with a British accent, originates from within the metamorphic rock resting on the floor. Its talking points include quasi-objects and automation. 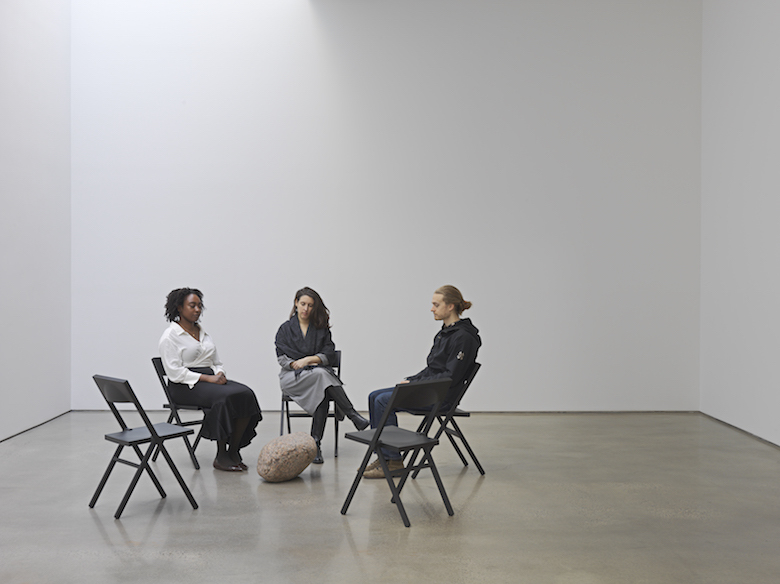 I sit in one of the five black wooden chairs corralling Philippe Parreno’s La pierre qui parle (The Speaking Stone) (2018) as I strain to hear the quiet voice as it competes with the noise generated by guests inside the expansive gallery. I sit with the rock for some time, leaning in to listen to the rock for its secrets, an outpouring I wonder if anyone else hears. I want to be told the answer to the question that one of the hosts had offered to me in an earlier exchange: “How does a new world/place come into being?” I don’t know how it happens exactly. Have I been missing the hints that purport to aid in elucidation peppered throughout the gallery? Perhaps. Small, barely detectable, fissures constantly form in our understanding that then crack and rupture to reshape what we know. Are new worlds forming constantly, slowly, deliberately all around us? Yes, and like eyes adjusting to darkness, it sometimes takes a moment until we can begin to see them. “Life To Come,” organized by Asad Raza, is on view at Metro Pictures, 519 West 24th Street, New York, until February 16, 2019.